Take an in-depth look at the connection between pain, posture and function. If you are new to myoskeletal alignment techniques, this is the first foundational course you should take. You’ll learn how to create a plan for each session using a 5-minute intake evaluation and will learn innovative new hands-on skills including deep tissue, joint stretching, and nerve mobilization techniques. As a special bonus, you’ll also receive instant access to the online eCourse for free (reg. $269). 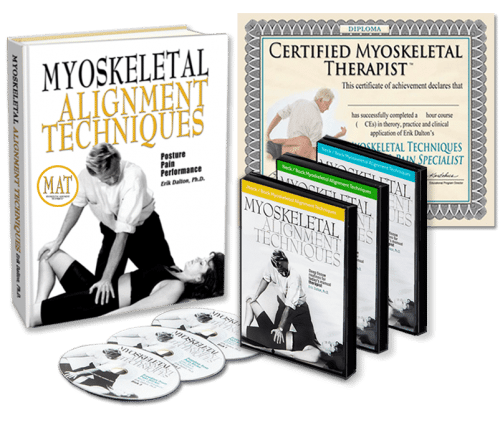 Upon purchase, you’ll be sent the Myoskeletal Alignment DVDs and textbook to study at home. Take as much time as you need to study and practice before taking the test. Once you pass the test, you’ll receive a handsome diploma and certificate of completion to submit for license renewal, as well as to proudly display in your office. You’ll also be listed in our online directory of bodyworkers with MAT training. Special bonus! Order this home study program and you’ll get free and instant access to the Posture, Pain, Performance eCourse.